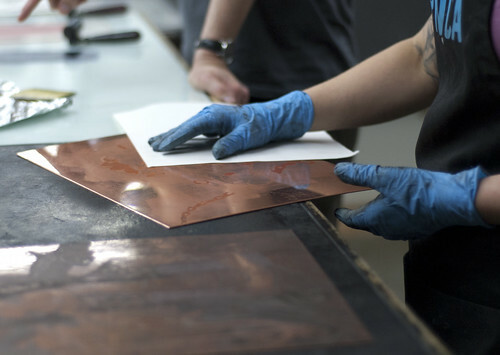 This course explores a variety of basic intaglio etching techniques including dry point,line etching, softground, aquatint, and simple approaches to B/W and color printing. Students at all levels are welcome. The primary goal of this course is to provide a thorough understanding of the materials used in intaglio, while also providing artists with access to intaglios unique materials and processes. Brandi Kruse grew up in Ypsilanti, Michigan and received her BS in Education from Central Michigan University with a focus on literature and art. She moved to Portland, OR in 2008 and after completing her eighth year of teaching high school she decided to be a student again. Kruse graduated with an MFA in Print Media from Pacific Northwest College of Art in 2016. Her creative process begins with photography and language and often manifests itself in prints and multimedia installation. She is a teaching artist, exhibition preparator, jewelry designer, adjunct professor and co-founder of a writers’ collective that has been publishing zines under the name of KC since 2013. Kruse was awarded a residency at Städelschule in Frankfurt, Germany and has shown her work many places locally and abroad, including: Worksound International in Mexico City, MX; Paper Plane Gallery in Atlanta, GA; Lost Coast Culture Machine in Ft. Bragg, CA; The Bemis Building in Seattle, WA; Museum of Contemporary Craft, Pataphysical Society and Verge Gallery in Portland, OR.